> "... let us all stop thinking urban OR rural"
"... let us all stop thinking urban OR rural"
Only 9% of the black, non-farming population of South Africa wish they could cultivate land. This was reflected in a survey carried out among 2500 black South Africans by a think tank called "Centre for Development and Enterprise". According to this survey, a majority of the black population prefers working in non-agricultural jobs and predominantly in cities. 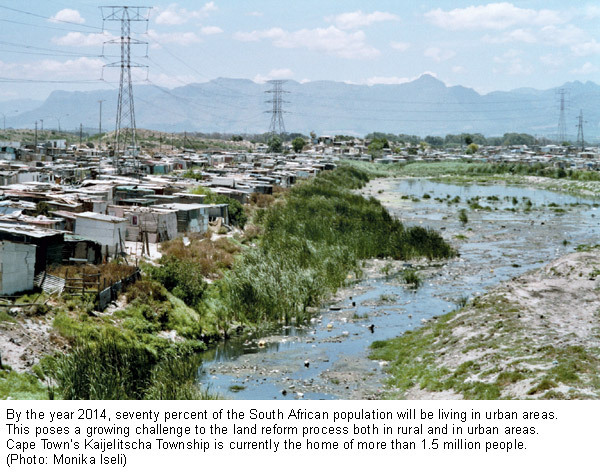 Already now, 60% of all South Africans live in urban areas. By 2014 their share will rise to 70%. When the African National Congress came into power in 1994, they gave the land reform utmost priority. However, the reform process is going slow. The government underlines the importance of the reform being based on sound legislation. The ongoing land reform has three main components: restitution, redistribution, and tenure security. All programmes are based on the idea that there are people willing to sell land, as well as people willing to buy it. The government plays the role of an intermediary. the state foster initiatives by the private sector and civil society that contribute to the land reform through mechanisms such as cooperations and agribusinesses. All in all, the think tank presents a liberal, market-oriented concept, which has not failed to provoke response from opponents. Masiphula Mbongwa, Director-General of the Department of Agriculture, and Glen Thomas, Director-General of the Department of Land Affairs, do agree with certain statements made by the think tank. They, too, see the land reform as something that regards not only rural, but also urban and periurban areas. They admit that the beginning of the land reform was slow, but point out that the process has been picking up speed in recent years. Finally, they acknowledge the fact that interesting private initiatives in support of the land reform should be fostered more systematically. However, they emphasise that urbanisation is a "... move of desperation". According to a report from 1998, 70% of the rural population live below the poverty line. According to the two government representatives, it would therefore be wrong to shift the reform's priority focus to urban areas. Dynamic rural communities with small- and medium-scale farms can contribute significantly to generating more employment opportunities, and reduce the above "move of desperation". The land reform gives the black population an opportunity to take an active role on the market and in the economy, and thus to grow more confident and gain strength. A secure "place to stay" alone cannot offer the same opportunities. In this debate, both parties neglect the land reform's impact on natural resources. A sound resource basis, however, is decisive for the sustainability of any reform. More thorough consideration also needs to be given to the consequences of the different procedures for women and for the poorest. The various, sometimes directly opposed arguments for a reorientation of the land reform in South Africa may spark new ideas for discussions in other regions of the world. > Land Reform for South Africa. Response to articles and interviews by Anne Bernstein emanating from "Land Reform in South Africa: A 21st Century Perspective". Masiphula Mbongwa (Director-General Agriculture) and Glen Thomas (Director-General Land Affairs). 2 June 2005. 4p. According to a FAO policy paper, bioenergy - the transformation of biomass into energy - has a great potential for poverty reduction and sustainable development. Biomass can be produced by local forestry or agriculture, a fact that represents a new opportunity for poor rural areas. On the one hand, bioenergy could cover the local population's energy needs, thereby reducing their dependence on imported fossil fuels. On the other hand, farmers could benefit from the cultivation of bioenergy plants by using them to diversify their production and regenerate degraded areas. The processing of biomass into sources of energy could provide new business opportunities and create jobs. Finally, the replacement of fossil fuels with renewable biological fuels would contribute to reducing greenhouse gases. However, the FAO paper does not give any concrete description of how these possibilities could be implemented in the context of sustainable rural development. The fact that bioenergy is not yet competitive enough economically rather dims the prospect of rapid progress. In any case, a poverty-reducing effect is only possible where bioenergy is produced in an environmentally and socially acceptable manner. Source: Bioenergy. Committee on Agriculture. Nineteenth Session. FAO. Rome, 13-16 April 2005. Item 7 of the Provisional Agenda. 10p. This highly optimistic title refers to experiences from the unprecedented gathering of 200 representatives of pastoralist societies from 23 countries which took place in Ethiopia in January 2005. Often the guarantors of the delicate ecological balance of their territory, this community of 200 million pastoralists from throughout the world are progressively losing their means of survival. 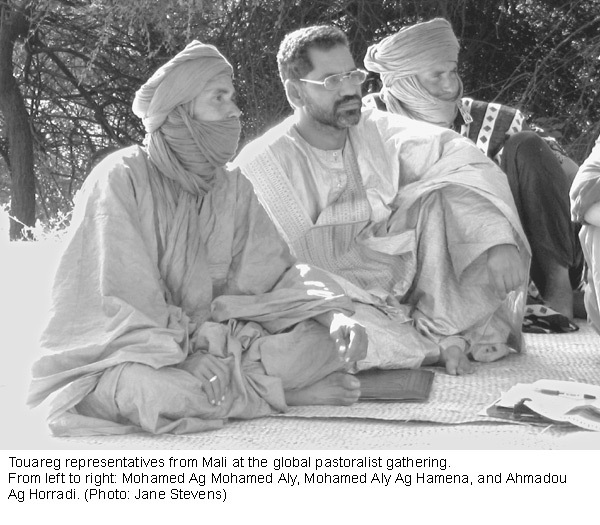 Increasingly, nomad farmers are faced with the occupation of "their" land by commercial farmers.This gathering enabled pastoralists to exchange ideas and discover new viewpoints. Mali, for example, is heading towards the implementation of the pastoralist codes of West Africa, which recognise the right of access to land, to migration routes and trade. However, according to the Mali representative Mohamed Ag, 80% of pastoralists in his country are unaware of it, and the council of ministers is slow to authorise the implementation of the code. The major issues which need to be addressed are the difficulties of disseminating information across the entire pastoralist community, encouraging their participation, and the power exercised by pressure groups, including those of commercial farmers. From this perspective, this first large-scale gathering represents a possible source of mutually beneficial alliances. "Development needs environmental protection": what used to be a key phrase of international development policy has by now degenerated into a mere platitude. In a policy paper addressed to the German government, the German Advisory Council on Global Change (WBGU) calls for an active return to this principal message from the 1992 Rio World Summit on the Environment. The policy paper was written with a view to this year's UN General Assembly in New York, which is seen as an opportunity to initiate a reorientation of international poverty reduction efforts. The German scientists demand that the West invest more funds into poverty reduction tied to global environmental protection. Just one example: In the South, a single storm can destroy the existence of an entire family or even a whole community. In recent years, storms have become more and more frequent. The industrialised countries must assume the main responsibility for the consequences of climate change. This is why the researchers demand that the North pay international compensation fees to the South and, at the same time, give up its destructive use of the Earth's ecosystems. Another essential message in the policy paper requests that the industrialised countries form more partnerships with so-called anchor countries, such as China or Brazil. These are countries that play a key role in climate change due to their size and economic dynamics. In short, this means turning away from the idea of broadly distributed project support around the entire globe. Will Africa yet again fall by the wayside? Better communication between the various forestry stakeholders at the international level facilitates the progress on all forest management issues. With this aim in mind, partner organisations and member states have focused on the harmonisation of forest-related terminology during Expert Meetings, organised by the FAO since 2002. The goal is to identify not only differences, incompatibilities and inconsistencies, but also common elements in existing definitions. The process involves highlighting the varied usage of a given term and where possible, their qualitative and quantitative relationships. Also, mindful of the multilingual environment, the harmonised terminology covers the following languages: French, Spanish, Russian, Chinese and Arabic. In January 2005, the Third Expert Meeting was devoted to terminology related to the biophysical components of forest resources and to human intervention aimed at ensuring the multifunctional management of forests. The key areas under discussion were natural forests, planted forests, trees outside forest, protected areas, and the forest functions. The results and agreements which arose from these meetings could be used to overcome certain communication problems, in particular during international meetings to discuss forest policy. Source: Proceedings. Third expert meeting on harmonizing forest-related definitions for use by various stakeholders. FAO, 2005. 148 p.
The lack of good governance in the forestry sector in many countries has a negative impact on a population's means of subsistence, the environment and external trade. The low credibility of law enforcement mechanisms, including the government agencies themselves, remains a major problem. This study of independent monitoring processes coincides with the EU Action Plan for Forest Law Enforcement, Governance and Trade (FLEGT), which involves political negotiations to alleviate the problem. The study examines the results of monitoring carried out by NGOs (international and national), as well as by the private sector in Cambodia, Cameroon, Indonesia and the Philippines. The aim is to determine the effectiveness of initiatives to improve access to information and the changes in the practices of legal enforcement agencies. To remedy current problems, the authors outline alternative funding mechanisms and question whether monitoring should be undertaken by national or international parties, since the latter seem less sensitive to pressure from local agencies. However, they find it difficult to reconcile their lobbying activities with their monitoring work, which requires total impartiality. Source: Review of Indepedent Forest Monitoring. David Brown, Cecilia Luttrell. ODI, 2005. 66 p. + 57 p. of appendices. A local radio programme in India asked the population for its opinion on what the national biodiversity strategy and the respective action plan should look like in detail. Farmers participated in the elaboration of a 14-part programme. The contributions were broadcast directly from the field. This is a possibility how people who depend on natural resources, who cultivate them day in day out and have a rich local knowledge, can influence resource policy. The same goal is pursued by the IIED "Power Tools" website. This site offers 26 tools that help bridge the gap between marginal groups and politicians. Providing opportunities for communication is not enough. Farmers and politicians perceive situations differently, express there views differently, and are not equally powerful. Therefore, facilitating genuine dialogue and negotiation of solutions takes several steps: understanding must be fostered, interest raised, structures organised, and liability secured. The tools provided on the website are divided into four groups accordingly. Is "Power Tools" just a new synonym for participation? Not quite: "Power Tools" sets a new priority by explicitly addressing the power discrepancy between land users and politicians. 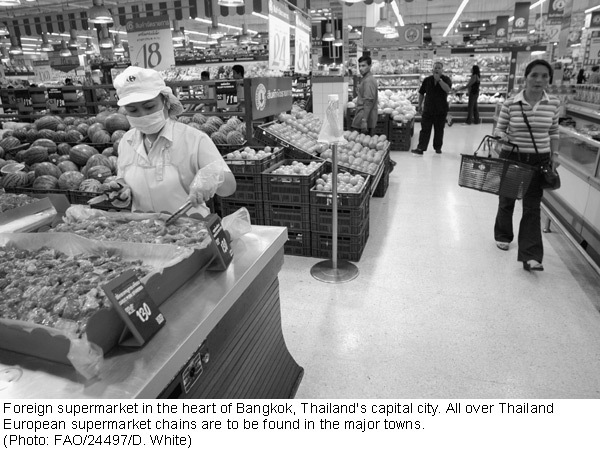 In Asia the number of supermarkets is growing fast. The region is following a global trend triggered by urbanisation and an increase of middle classes with a new lifestyle. So far, consumers still buy their fruit and vegetables predominantly on traditional markets, but this may yet change. As new players in the agricultural supply chain, supermarkets set new terms for their suppliers. They try to centralise the procurement of goods and demand standardised product specifications, guaranteed quality, and fast supply. In order to fulfil these conditions, farmers need to make investments; at the same time, however, supermarkets constantly work to bring down the prices. Moreover, it is impossible for small-scale farmers to supply 365 days a year or to wait up to 90 days for their products to be paid. The author of this paper recommends several measures as a reaction to these new challenges. On the one hand, traditional markets should be enhanced in order to counterbalance supermarkets: with support from the government, producers could improve their markets' quality and consumer friendliness. On the other hand, the state should act as a mediator between farmers and supermarkets. For example, the government could foster collaboration among farmers, finance distribution centres, and develop new prepayment systems for the farmers. farmers and traditional marketing systems in Asia. Andrew W. Shepard. FAO, Rome, 2005. 16 p.
According to official statistics, women produce 30% of the profit generated by South American agriculture and represent 26% of the agricultural working force. The actual numbers are estimated to be higher, and are further increasing. This is the result of a study carried out by the UN Research Institute for Social Development UNRISD. The study explains how the economic crisis and neoliberal restructuring in South America has aggravated rural poverty. Farmers' families are often forced to diversify their sources of income. This leads to feminisation of agriculture: On the one hand, the portion of women working in agricultural production increases because the men find jobs outside the agricultural section. On the other hand, more and more women work as employees in the non-traditional agricultural export sector, which includes the production and packaging of vegetables, fruit and flowers for markets in the North. Unfortunately, the study does not go beyond this interesting analysis. Issues such as the impact of feminisation on resource use or possible needs for action are left unaddressed. To overcome the economic pressure which threatens tropical forests, advocates of sustainable management are always on the search for tangible and scientifically-based arguments to back up their case. This article studies the relationship between forest cover and hydrology for all river basins intersecting the world's tropical forest biomes. It outlines the risks of deforestation on flooding frequency by also taking account of the biological diversity of the forests in question. To illustrate how this relationship evolves over time, the study delineates three temporal stages: "initial" ecoregions as established by the WWF, current land use, and finally a 30-year prediction of forest cover. The calculations were made using a number of different models, in particular the "Water Balance Model" (WBM). The WBM is a large-scale hydrological model which makes it possible to evaluate the impact of changes in land use on river outflows. Based on scenarios involving a regular process of deforestation, the authors predict that 100 million people living in the Tropics could find themselves in a vulnerable position and will see an increase of more than 25% in annual water flow. Consequently, the living conditions of several floodplain populations, particularly in Southeast Asia, remain extremely dependent on the conservation and sustainable management of their forest ecosystems. Source: The role of tropical forests in supporting biodiversity and hydrological integrity: A synoptic overview. Ellen M. Douglas... et al. Worldbank, 2005. 23 p.
Roses are an important export product of Colombia. However, they are often infested with mildew, leading to great losses and high costs for chemical fungicides. This is why flower producers turned to the Centro International de Agricultura Tropical (CIAT) and asked whether there were no other methods of combating this fungus infection. 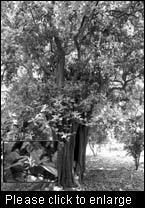 For a number of years, the CIAT had been testing the effect of Swinglea glutinosa extracts on harmful organisms. 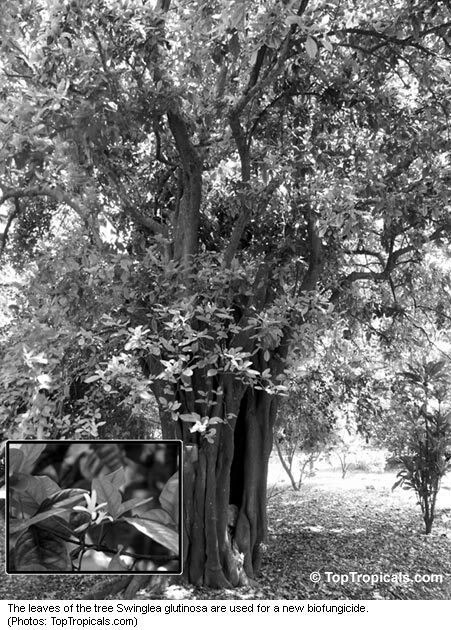 A technician had observed that this tree was never infested by fungi. He produced various Swinglea leaf extracts and tested their effects on fungi living on different plants. The testing began two decades ago, when chemical pesticides were still broadly accepted and there was little interest in natural substances. Only the recent increase in demand for biological agents has enabled the CIAT to transform these research results into practice. In the meantime, the biofungicide is being used by several flower producers. Since the product is also effective against mycoses in coffee, beans, and one particular grape species, it is increasingly used by farmers. One great advantage of this biofungicide is the fact that it can be produced locally, making it cheaper than conventional pesticides.